While I commend the tour director for trying to stay on schedule it was very scary to realize she was leaving a guest behind! I think some wiggle room should have been built in the schedule for that kind of thing. Also the tour winds up in a “flea market” section of Tokyo. I would rather have been given a tour option that allowed for more time at the shrine and the Imperial Gardens. In order to see parts of those the tour guide Julia had to walk at a pace that left most guests behind (and confused on where to go). The tour was disappointing. We couldn't get to the East Garden of the Imperial Palace due to traffic and there was hardly any live commentary. It felt like a mere bus ride. The tour guide spent half of the tour sorting out the tour booking of two passengers. The difference was the guide: Mr. HIroshi, with a great sente of humuor, with very Good informations regarding not only the tour but also Japan's history. Good time of tour and very Good driver. The tour was a taped out of date talk that told us that in 2016 these things would happen. The tape often malfunctioned. We were dropped off at the fish market and left to fend our own way home. This tour was informational - yes via a recording that you listen to via headphones. But it is something you could have done yourself. 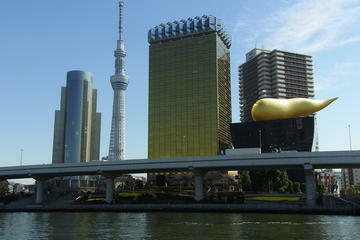 The tour agent did not do any walks with us into the places we visited, such as the temple and Tsukiji. We were left to roam around by ourselves and didn't really see much. I do not recommend this tour, and suggest anyone signing up to sign up with something better where the agent goes everywhere with you. We didn't really see anything in Tsukiji as we were dropped off outside by the road and were told to just walk. I lived many years in Tokyo without seeing some of these sights. I would recommend this tour for those with limited time available.